While the major projects in my laboratory are focused on Quantitative Biomedical Image Processing and Analysis, I am also interested in building novel biomedical instruments. During my post-doctoral work in the Optical Radiology Laboratory at Washington University School of Medicine, I obtained training on Biomedical Instrumentation. I also have contributed in this area by developing novel instruments for biomedical imaging. Brief descriptions of my projects on instrumentation are provided below. 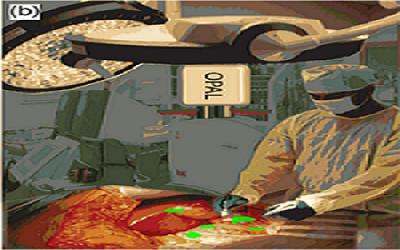 We have developed a novel system, optical projection of acquired luminescence (OPAL), to further enhance real-time guidance of open oncologic surgery. In this method, collected fluorescence intensity maps are projected onto the imaged surface rather than via wall-mounted display monitor. In the figures presented below, the two figures in the left column describe cartoons of existing and proposed fluorescence guided surgery (FGS) methods. In the existing FGS method, fluorescence information is displayed on a flat-screen monitor, while our proposed FGS method OPAL directly projects fluorescence information onto the surgical field, "highlighting" the tissues with high concentrations of fluorescent contrast agent (green). The two figures in the middle column depict the schematic and a snap of our developed system for small animal imaging. The two figures in the right column depict frames from a video capture from OPAL for identification and removal of peritoneal tumors 24 h after injection of tumor-selective near-infrared fluorescent molecular probe. P. Sarder, K. Gullicksrud, S. Mondal, G. Sudlow, S. Achilefu, and W. Akers, "Dynamic optical projection of acquired luminescence for aiding oncologic surgery," Journal of Biomedical Optics, vol. 18, no. 12, pp. 12501:1–3, 2013. I obtained training on building this novel multi-photon microscopy system from our collaborators at GE Global Research (Niskayuna, NY, USA). I later established this system at the Optical Radiology Laboratory in 2011. 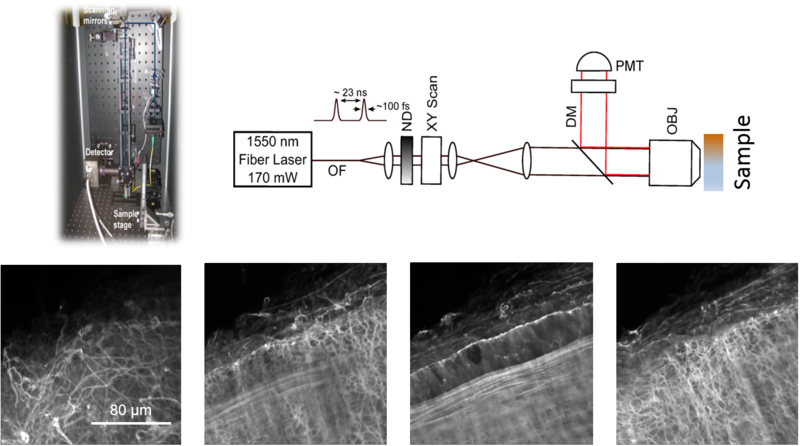 This system is capable to perform multi-photon microscopy (MPM) imaging of near-infrared (NIR) fluorescent molecular probes using nonlinear excitation at 1550 nm. This is in contrast with the existing MPM systems which can only image visible fluorophores. In the figures presented below, the left figure on the top row depicts a snap of the system that I established, and the right one describes a schematic of the imaging mechanism. The figures in the bottom row depict MPM images acquired using our system from different focal planes of a 150 µm thick mouse artery tissue sample containing NIR fluorescent molecular probe. Detailed study on the depth penetration capability of the all-NIR MPM system is described in the reference listed below. 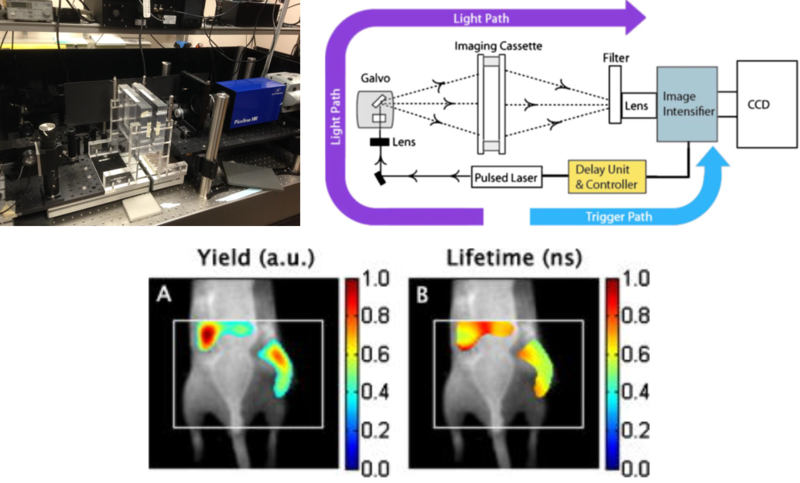 P. Sarder*, S. Yazdanfar*, W. Akers, R. Tang, G. Sudlow, C. Egbulefu, and S. Achilefu, "All-NIR multiphoton microscopy interrogates intact tissues at deeper imaging depths than conventional single and two photon NIR excitation microscopes," Journal of Biomedical Optics, vol. 18, no. 10, pp. 106012: 1–11, 2013. 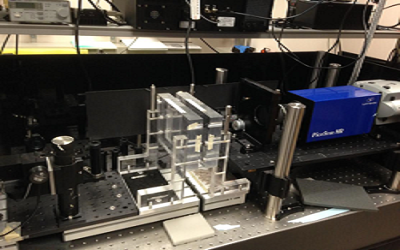 I obtained training on building this unique system for imaging fluorescence lifetime (FLT) in deep tissues using diffuse optical tomography (DOT) imaging mechanism. This system is not available from any commercial sources at this moment. Also, FLT based mechanism has not been extensively explored yet for in vivo deep tissue imaging using DOT, while fluorescence intensity based mechanism has been heavily employed along this direction. In the figures presented below, the left figure on the top row depicts a snap of the part of the system that I have implemented, and the right one describes a schematic of the imaging mechanism using this system. 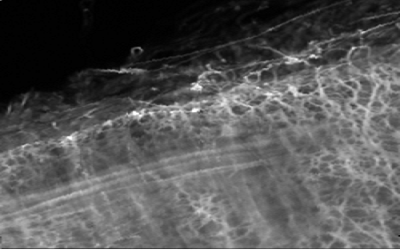 The figures (Nothdurft et al., JBO, 2009) in the bottom row depict fluorescence yield at 8 mm depth from the dorsal side for a mouse with tumor and the corresponding FLT image. The subcutaneous tumor is evident on the right flank along with accumulation in the liver. The imaging was done 24 h postinjection of a targeted near-infrared molecular probe. We upgraded the Olympus FV1000 confocal laser scanning microscope at the Optical Radiology Laboratory to a fluorescence lifetime imaging microscope (FLIM) in 2011 for imaging near-infrared (NIR) contrast agents. This upgrade was done in collaboration with Becker & Hickl. This was the first system reported for imaging NIR dyes using FLIM mechanism. We demonstrated that our system reports the lifetime distributions of NIR fluorescent dyes with different fluorescence lifetimes in cells. In the figures presented below, the figure in the left column depicts a schematic of our developed system. 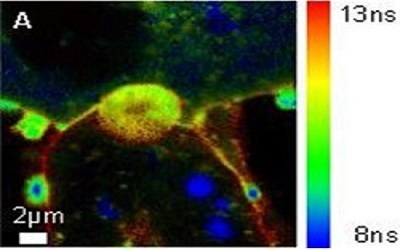 The three images in the right column depict FLIM images of cancer cells treated with a targeted NIR molecular probe. Images were captured 15, 60, and 105 mins after the dye treatment. In these images, diverse lifetime in the cell microenvironment is visible. R. Nothdurft*, P. Sarder*, S. Bloch, J. Culver, and S. Achilefu, "Fluorescence lifetime imaging microscopy using near-infrared contrast agents," Journal of Microscopy, vol. 247, no. 2, pp. 202–207, 2012.